• sarah protzman howlett: Yep, that’s me. I got hitched in October, hence the revamped professional name. 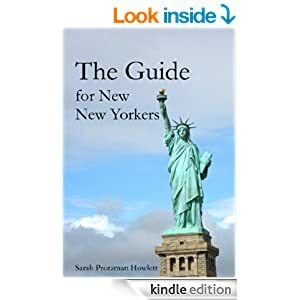 • how to move to nyc without a job: I’ve written lots on this topic because I did move to NYC without a job — granted, it was pre-recession and post having saved up a few thousand dollars (which, believe it or not, took me almost 18 months to do on a journalists’ salary). • why should i move to brooklyn: You might be looking for this somewhat infamous post, which caused a stir with folks who live and die by the BK. This phrasing makes it seem like maybe people who already did the Manhattan thing are looking to relocate, which I would support over moving from far away to Brooklyn straight out of the gate for the reasons outlined in said post. • where can i skimp on wardrobe: If you’re asking me, I am a huge fan of Old Navy and Gap for knockaround clothes, and the Banana Republic sale rack for work stuff [yes, I know these guys are all the same company!]. Be choosy at factory/outlet stores: They often make clothes with cheaper materials and pass it off as if it would’ve been $75 in stores…when the truth is, it never was in stores. Flip tags over and you might see an “FS”…a dead giveaway that it was the made-for-TV-movie of name-brand garments. • brian i carr dating: All I can make of this is a combination of the interview I once did with well-known NYC film scout Nick Carr, and that the worst date I’ve ever been on was with a Brian, which I’ve written about in my book. • how long to allow a friend to sleep on your couch? This is a tricky one. In a place like New York, I’d say three or four nights, tops. If guests, like fish, start to smell in three days, then in a Manhattan studio, the stench probably surfaces after just 24 hours.